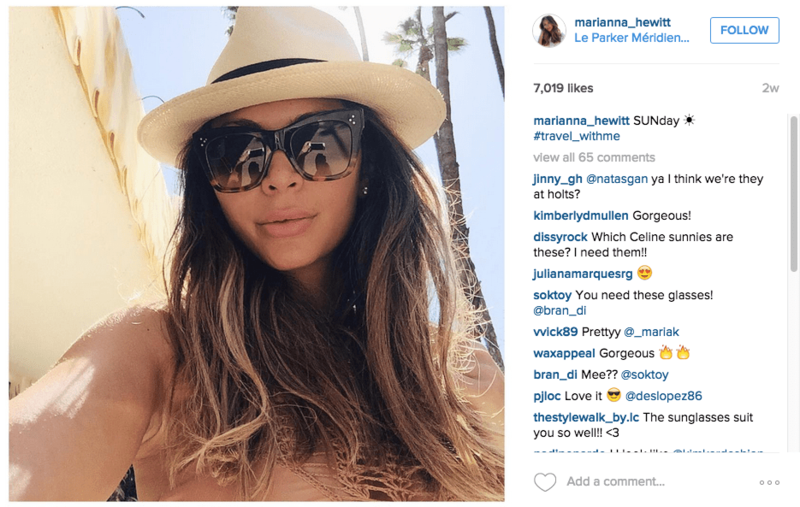 Profiting from Social Media: Instagram Stars Earn Luxury Hotel Stays | The Next Thinc. If you want to get comped in Vegas, develop a big gambling habit. To get comped in luxury suites pretty much anywhere, develop at least ten thousand followers on Instagram. With any luck, you’ll soon be ordering room service and lounging spa-side in an embroidered bathrobe, uploading the occasional selfie with a prominent location tag. Next time, try to avoid reflecting your smartphone in your designer sunglasses, Marianna. This article from Fortune.com tells the story of 28 year old lifestyle blogger Marianna Hewitt who takes an international trip about once a month, all expenses paid. It highlights her trip to The Mulia Resort in Bali, Indonesia where her entire stay was comped in exchange for some prominent mentions on her Instagram posts. Marianna is not signed to CAA. She isn’t part of Maker Studios. She is simply a photogenic woman with a good sense of personal style and a predilection for shooting tastefully-composed selfies with a narcissist’s bent. Oh, and she has 431,000 followers on Instagram. Let’s not forget that. This is the brave new world of individual network broadcasting, the same one that transformed the Kardashians into ultra-wealthy moguls of modern media. Most of these social stars lack representation, many want to monetize, and all juggle the balance between the content that built their reputations and the corporate dollars that can make them pay off. Some stars like Marianna play on photogenic looks and a crowd-endorsed editorial photography style that promoters consider a proven commodity. Others play on their ability to build engaged communities around various passions, some of which inevitably overlap with advertiser’s needs. And some will never really find a home in corporate America, at least not without risking the following they’ve earned through their own, original voice. We’re living in a brave new world filled with all kinds of valuable social ad networks to leverage. This is where your best content should play. Because this is where you best audience probably is. ← Before We Build Our Agency, We Are Building Our Culture.